This recipe was inspired by the lovely Amber over at The Tasty Alternative. Amber recently posted a wonderful recipe for Homemade Almond Milk. Although I used to make my own Almond Milk all the time; admittedly I have been slacking lately and buying it at my local health food store–time to change that! Fresh, pure ingredients are always better. A great read on what’s wrong with packaged Almond and Coconut Milks can be found here. My daughter always spots the Organic Strawberry Milk at the health food store and asks to get it. Have you seen how much sugar is in these “healthy milk” packages?! It boggles my mind that they get away with claiming these drink as healthy. After spotting some strawberries at the store today, I decided to see if I could create my own version of Strawberry Milk at home. My daughter came back twice asking for more milk, so I think the recipe was a success! This milk is creamy, fresh and lightly sweetened. Almonds are rich in calcium, iron, magnesium, protein and Vitamin E. Strawberries are an incredible source of Vitamin C.
In a large bowl, soak 1 cup of almonds in 6 cups of water for at least 6 hours. I like to replace the soaking water at least once during this time, if possible. After 6 hours (or longer), drain and rinse the almonds. Place the almonds with 6 cups of fresh water in a blender or Vitamix. Blend on high for 2 minutes. Strain the milk with a nut milk bag (or strainer). Set the almond pulp aside and put the strained milk back into the Vitamix. Add in the strawberries, honey and stevia. Blend on high for 1 minute. Enjoy! In the mood for chocolate instead? Try my Dairy-Free Creamy Chocolate Milkshake. This recipe was shared on Full Plate Thursday, Gluten-Free Wednesdays, WLWW, Healthy 2 Day Wednesday, Slightly Indulgent Tuesday, Hearth and Soul Bog Hop, Traditional Tuesday, Fat Tuesday, Just Another Meatless Monday, My Meatless Mondays, Real Food 101, Made at Home Mondays, Better Mom Mondays, Homestead Barn Hop, Monday Mania, Sunday School, Allergy Friendly Friday, Fight Back Friday, Freaky Friday, Frugal Friday, Fresh Bites Friday. Laura, do you use blanched almonds or just regular raw almonds? I've been wanting to make my own almond milk for some time and this recipe looks so good for the kids! 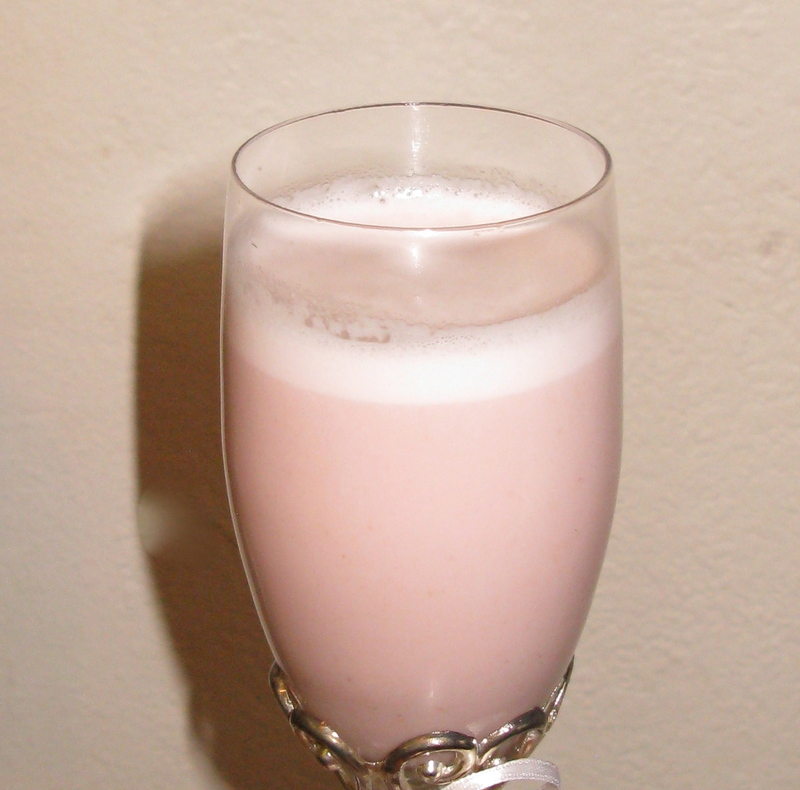 I drink almond milk in obscene quantities…this strawberry milk is a need-to-try! I think it would make for the perfect weekday dessert! I love a strawberry shake and I love that you added almonds. Looks super yummy!! Ooooh, sounds delicious! May see if I can make some…I have almond milk in the fridge and just bought some strawberries! yum! I use whole, raw almonds for this recipe. The leftover almond pulp/meal can be used in salads, baking, etc. Have a wonderful weekend! I like this one, because it's almond based and not coconut based. Almond is much healthier for people not allergic to nuts. I have to admit it really is so yummy…I might make it again right now! This looks sooo amazing. My kids (and husband) would go crazy for this drink! You're such a doll for the link love! Thanks for sharing such a fun, easy recipe! This is awesome. I love the flavor of strawberries, but hate that cloying "strawberry" flavor they put in so many products–it does not in any way, shape, or form, resemble real strawberries! I really want to try making my own almond milk now, because I normally buy it. i love adding fresh fruits into non dairy milk.. it becomes such a balanced drink. all the fresh fruit, natural sugar and some protein from the nuts.. i dont believe anything the food industry says anymore.. such crap in almost everything. Ahh Orange Julius…brings back so many childhood memories! Now that would be a yummy, healthy drink at home! I too dislike fake strawberry flavored foods and drinks. Isn't always so much better to use real food ingredients?! This sounds delicious, and so healthy too. Strawberries and almonds go so well together! Thank you for sharing your Strawberry Almond Milk with the Hearth and Soul hop. What a delicious treat! This would be a huge hit with my kids. I wanted to come back to update you. I finally made almond milk and strawberry almond milk (forgot to add the vanilla-oops!) and it was yet another huge hit here at our house. My youngest son never liked the store bought almond milk (Silk or Almond Breeze) so I had to continue purchasing rice milk for him. After trying both milks (he also helped me make them) he said he'll start drinking it and loved it! YaY! Now, what do I do with the 2 cartons of rice milk in my pantry? LOL! My daughter who likes cow milk will try the Strawberry Almond Milk in the morning. The left over pulp is drying on low in the oven now. I'll make gluten free brownies with later this week with it. Thanks again for sharing such awesome recipes! Your updates and comments always make my day! I am so glad your kids like it. Hmm…what to do about that rice milk? Use it up in a few baking recipes perhaps?! I want to get your recipe for brownies made with almond pulp-sounds so healthy!